I bought the mango last week, attracted by its shape and color, but it wasn’t quite ripe yet. As it aged, it changed in wonderful ways, developing new speckles and coloration. My patient husband looks at it longingly. Are we having margaritas yet? 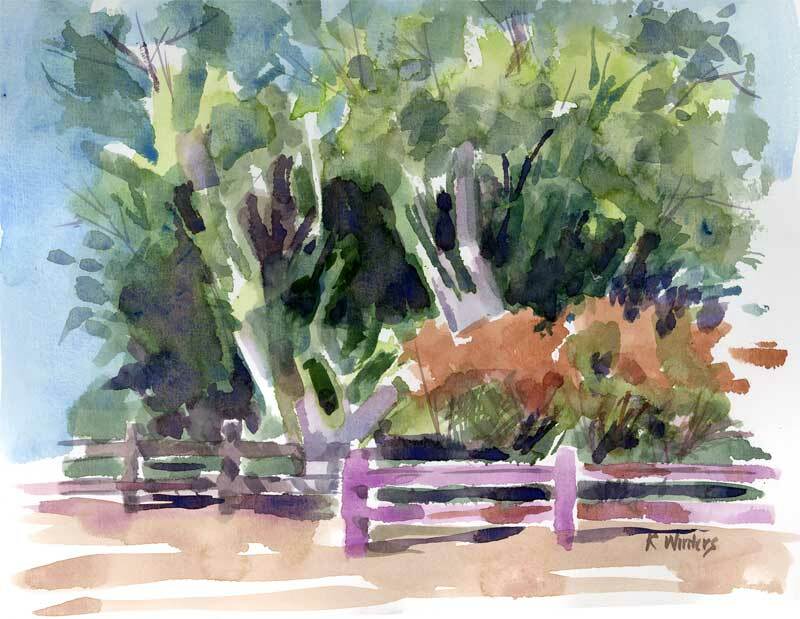 Today we took a drive up to Santa Barbara to scout a location for a work project, and my dear husband suggested I turn it into a painting day as well. I had never visited the Santa Barbara Botanic Garden, which enjoys a reciprocal membership with Descanso Gardens, so we spent a little time there in the early afternoon. Unlike Descanso, all of the plantings are California natives. Just walking through the oak groves and open meadows reminded me what natural beauty we have here without planting water-demanding non-natives. 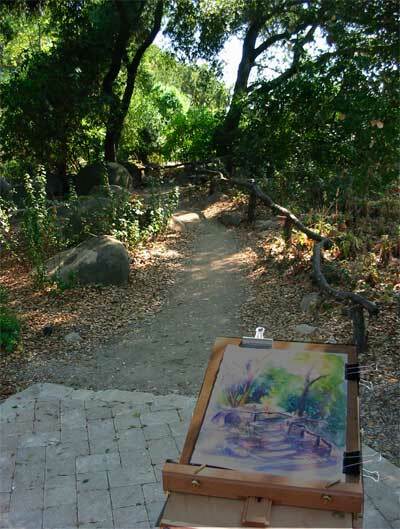 I found a shady place at the entrance to one of the trails and set up my easel. This was painted using three brushes: a one inch flat, a #12 round and a ‘rigger,’ which is a thin, flexible springy little brush. As usual, the light was changing rapidly as the sun is wont to do. Even in the 75 min. or so that I spent painting, the shadow patterns had shifted dramatically. So I’m going to call this an entry for the “Go Somewhere New and Draw (Paint) what you see” challenge. Another fast and rough sketch in the 9 x 12″ Raffine… in preparation for doing another painting in watercolor or oils. This one was painted with a half inch flat and a #12 round. Late afternoon on a tropical California side street. 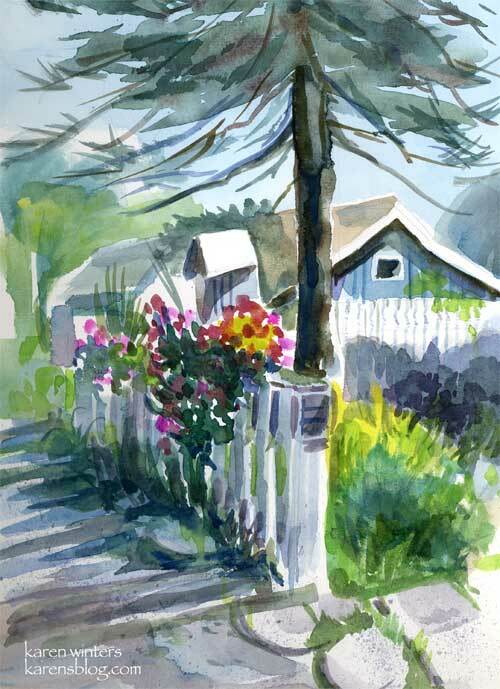 In fact, it’s right next door to this house Capistrano Fence which I painted about a month ago. The 20th anniversary issue of Watercolor magazine came in the mail the other day … oh, my the inspiration. If you haven’t seen it, go get it at the newsstand. The work is just outstanding … it makes you want to vow not to let a day go by without painting. Yesterday I got my first Raffine sketchbook by Lana, recommended by Lin Frye, so I decided to give it a test drive. The 9 x 12″ paper is very thick and slightly absorbent, and I’d say it takes a wet wash pretty well without bleeding through the back side of the paper. There was only slight buckling. I used a 1″ flat brush for this sketch and a thin flexible “rigger” brush. For quick studies (this took about 15-20 minutes) and an economical price tag (12.99 for a 48 page book) this might just be my favorite so far. I even like the slightly rough texture which makes it possible to get some interesting textures. I haven’t tried a watercolor Moleskine yet, but the large size of this sketchbook appeals in that it allows me to use a bigger brush and to concentrate on large areas of color and value. Watercolor colors used: light red, quin magenta, burnt sienna, cobalt blue, sap green, yellow green. This was one of the other watercolor sketches that I did on our paint out day last Tuesday. (Compare with the other sketch – scroll down.) It was toward the end of the morning and I just grabbed a smaller piece of Fabriano to experiment on with more calligraphic brushwork. I had no expectations which was quite freeing, actually. The limited palette encouraged me to think more about shape and value and less about mixing a whole bunch of colors. Some was painted wet in wet, and some painted after it dried. I’m thinking that this might be a good warmup exercise for the next outing, but because the light continues to degrade as the morning goes on, I usually want to get busy on a bigger piece. 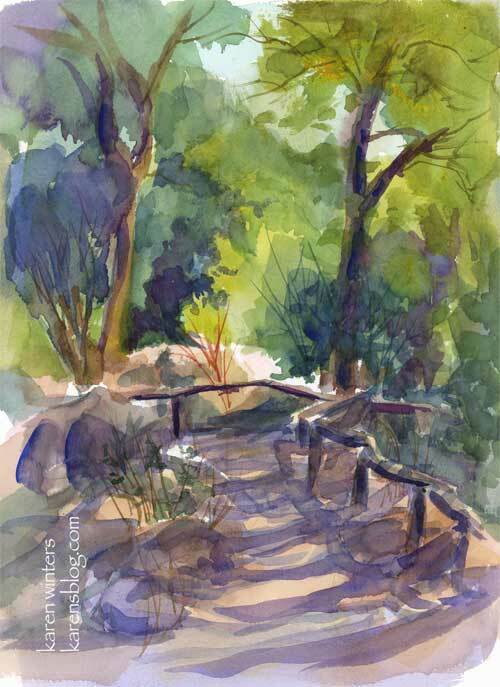 Today our paint out group went to Eaton Canyon Nature Area in Altadena, CA … a new place where I had not painted before. 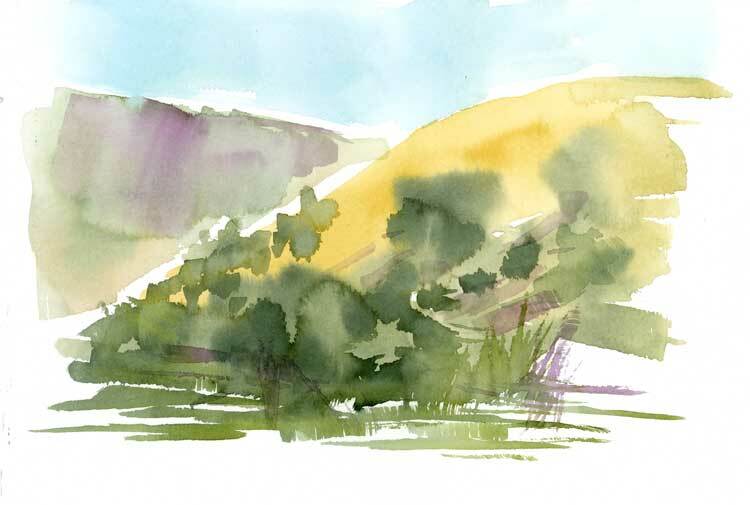 In the early fall some of the trees were starting to show tinges of brown and gold, and the hills were brown from the long dried-up spring rye grass. 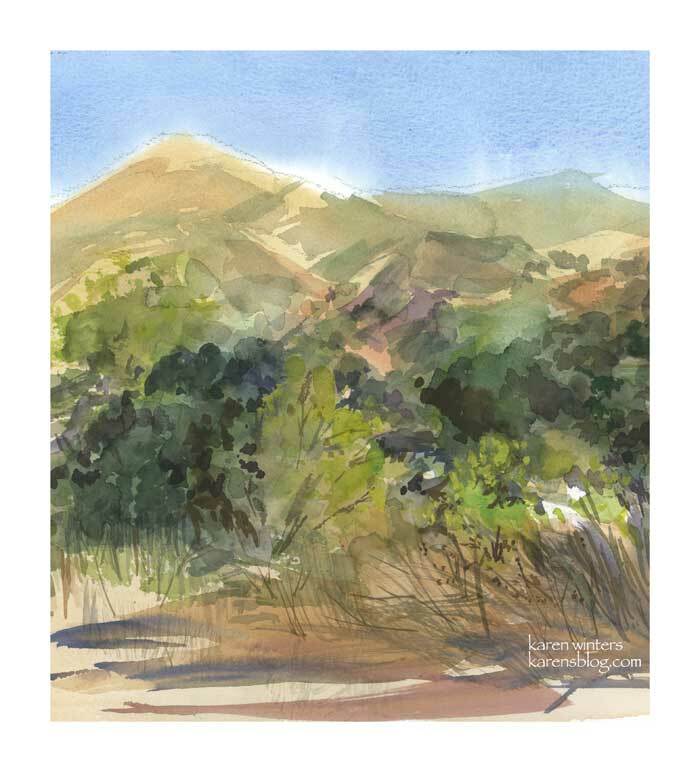 This is typical California chapparal – hills scattered with oak trees and occasional accents of chemise, toyon and buckwheat. This on location study is going to be the basis for an oil painting one of these days. I’m looking forward to going back there again soon. 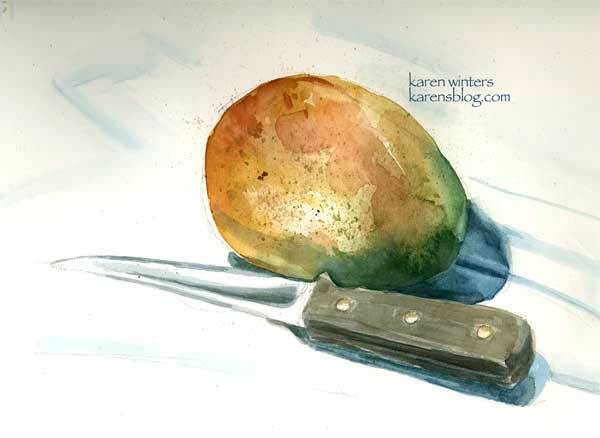 Check back tomorrow – I have two more (looser) watercolor sketches I did today, but I need to get them scanned up. 11″ x 11″ Mixed media, watercolor and pastel. Unframed. Well, I have finally decided to take the plunge and list something on eBay. Thanks to all the friends who have written me and given me the push to make it happen. Prompted in part by the recent Illustration Friday theme of Farm, which I missed last week … and prompted also by the Ebay Art Squared (Art2) September theme of “Illustrate a song” – I decided upon one of my favorites, Sting’s “Fields of Gold.” I can scarcely think of another contemporary ballad that speaks to me so well about the cycles of life and love and enduring devotion. When the theme, the song and the concept came together, it just felt right. The Art Squared group theme features artwork that is in a square format, from very small up to 14″ x 14″. Enjoy the lyrics again – or for the first time – here. This mixed media painting comes partly from the imagination and partly from my reference files. After doing a smaller sketch on Stonehenge paper, I painted this directly on 140# watercolor paper, using several large brushes both rounds and flats. When those underlayers were finished and completely dry, I still found that it needed a little something extra. 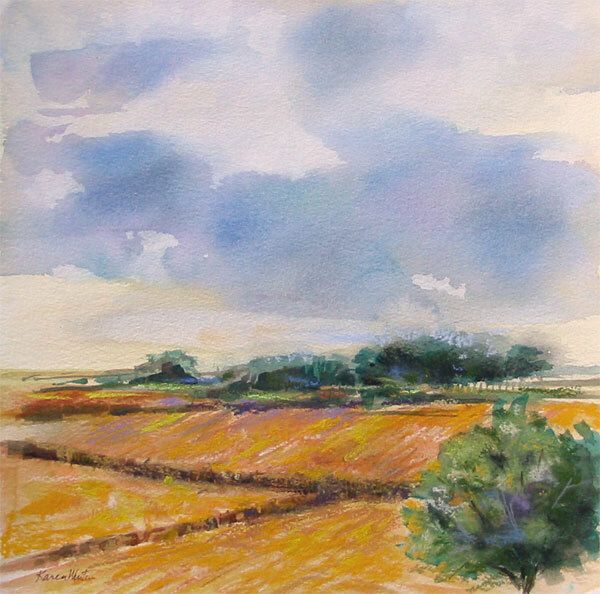 But I didn’t want to risk muddiness with glazing, so I reached for my pastels instead, adding more color to the clouds, the barley fields and foreground trees. Sometimes you just have to improvise.